If there’s one thing parents envy about their kids, it’s their uninhibited imaginations. Picture books are the perfect way to celebrate children’s innate to ability imagine fantastic machines, invent new forms of travel and believe anything is possible. All of these books to inspire young inventors and engineers are also great for STEM and STEAM learning and for teaching growth mindset. 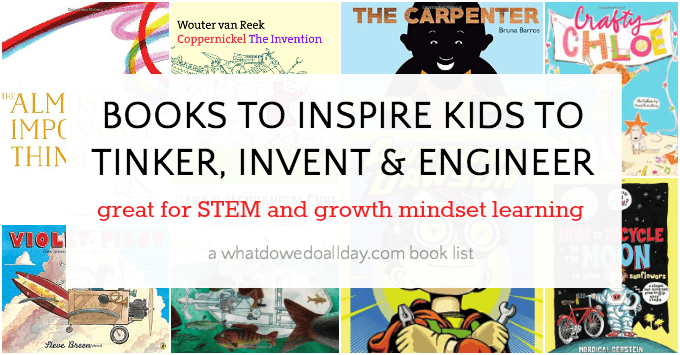 Be sure to also check out these great STEM books for kids! Rosie Revere, Engineer by Andrea Beaty and David Roberts, the team behind Iggy Peck, Architect. Imaginative Rosie loves to tinker, build and invent. She gets discouraged when her inventions flop on the first try. Her wonderfully eccentric great-great-great aunt, however, explains to her that a flop is a successes because it paves the way for the next step in the inventive process. I love this message because it encourages kids to keep trying and trying – that genius talent is not necessary for success. It’s perseverance that helps us improve. The rhyming, winsome text is infectious and the illustrations are full of imaginative inventions that will get kids chatting. Also available: Ada Twist Scientist. Violet the Pilot by Steve Breen. I was excited to find a second book about creative kids with a girl protagonist. I was rather afraid most books would star boys with tool belts! Violet Van Winkle is a mechanical genius. At the age of 2 she was fixing appliances, at the age of 8 she was inventing elaborate machines like the Tub-bubbler, a flying bathtub. She wants to win over her skeptical classmates and so builds a flying machine to enter into the Air Show. On the way to the show, Violet makes a decision that shows she is not just about engineering but she has a strong character as well. Kids will love the illustrations of all the flying machines Violet invents. Papa’s Mechanical Fish by Candace Fleming, illustrated by Boris Kulikov. This book was inspired by inventor Lodner Phillips, the creator of one of the first modern submarines. His family took an underwater trip in his invention in Lake Michigan in 1851. In this picture book the children observe their father inventing one “mechanical fish” after another. Determined to make a workable submarine, he tests each new invention out, adding improvements and starting over again. The narrator asks her father questions about fish, such as how they swim, how they see, etc. and each question inspires a new improvement of the machine. I love the way the whole family shows support and enthusiasm for the father’s work, even though it is a bit eccentric. The onomonopoetic text adds a nice touch and kids will join in each “Clankety-bang!” and “Clacketa-claketa-clacketa!” Also available as an ebook. Awesome Dawson by Chris Gall. I originally checked this one out from the library because the author wrote Dinotrux, a book my 4 year old adores. Dawson is a kid who has been inventing things since birth. He upcycles everything he can get his hands on and has a secret workshop in the basement. One day he realizes he needs to invent something to do his chores for him or his mom’s nagging will never stop interfering with his work! (It’s always the mom, isn’t it.) Thus, the Vacu-maniac is born. The Vacu-maniac gets a bit out of control, however, and Dawson must find a way to reign it in. There is tons of stuff to look at in every illustration and my sons both loved how Gall labels all the different items strewn over the pages. I liked how Dawson deliberately reuses junk and parts of discarded items for his creations. This would be a fun book to read in conjunction with an upcycling craft project. If I Built a Car by Chris Van Dusen. Young Jack has grand ideas for his fantasy car and he relates them all in fast-paced rhyme. Would you like a car that has a built in swimming pool? One that drives itself without sacrificing safety? One that goes underwater? That flies? Well, Jack’s car is made just for you. There’s no plot per se, but the ride is certainly wild! If your child is more domestic then check out If I Built a House. Both books can be followed up with discussion about how your child would design his or her dream car and home. Also available as an ebook. Anything Is Possible by Giulia Belloni, illustrated by Marco Trevisan. Jealous of the birds’ ability to see life from different perspectives, a sheep decides he wants to build a flying contraption. The wolf (gotta love the sheep-wolf pairing!) is not convinced it’s possible. The motto of this book is “if at first you don’t succeed, try, try again,” a saying we are all familiar with and which is worth teaching our kids. I really liked the illustrations, which are mixed media collage with an interesting contrast between the simple animals and the elaborate inventions. I agree with many of the reviews that the book seemed a little incomplete, but I think it’s worth getting from the library. How to Bicycle to the Moon to Plant Sunflowers: A Simple but Brilliant Plan in 24 Easy Steps by Mordicai Gerstein. This book was also on my list of fiction picture books about the moon but it’s such a fun read for older kids it’s worth including here, too. Using a garden hose, a slingshot, a NASA spacesuit and lots of imagination, a boy lays out his plan to travel to the moon…. by bike. This is a very enjoyable book with a lot of humor and also a bit of magic with an ending that will bring a smile to your face. Galimoto by Karen Lynn Williams, illustrated by Catherine Stock. The first time I read this book, I kept waiting for the explanation of what “galimoto” means. I thought it was odd that my kids never asked what a galimoto was until I realized that it was my adult sensibility getting in the way. A galimoto is simply a push toy crafted out of found material. I was hung up on the word, whereas my kids were just listening and following the story! D’oh! (There’s actually an explanation of the word at the beginning of the book which I missed.) Kondi decides he wants to make a galimoto out of wire, he’s been saving up in his shoebox. Undeterred by his short supply he wanders around his village in search of more wire. I love how his determination to make a galimoto is also admired by the others he meets during his search and that despite a few obstacles he remains persistent. Even when he finally completes his toy, he looks to the future, imagining what he will make next. Monkey with a Tool Belt by Chris Monroe. Let’s put aside for a moment the issue of this monkey’s bizarre name, Chico Bon Bon. Instead we will focus on his love of tools and tinkering. Chico Bon Bon’s mad tinkering skills come in handy when he is captured by an organ grinder and hauled around town to a secret lair. Fortunately, the organ grinder failed to remove the monkey’s tool belt and our hero is able to escape. This is just a quirky story all around and Chico’s impromptu escape mechanism had my boys giggling. The Carpenter by Bruna Barros. A wordless book that you can use to inspire kids in their toddler years on up. A boy becomes enraptured with the possibilities of a measuring tape and abandons electronic screens in order to create and construct. Marvelous. Coppernickel, The Invention by Wouter van Reek. Coppernickel the bird and Tungsten the dog decide to invent an elderberry-picking machine. Coppernickel draws a diagram of his invention which fills his work surface and starts to spill over until he is caught in his own invention! Tungsten’s invention is a bit more sedate: a fork on a stick. This book was a bit of crazy, silly fun and my 8 year old really liked pouring over the diagrams to see how the invention would work. What Do You Do with an Idea by Kobi Yamada, illustrated by Mae Besom. A boy has an idea. He shows it to others, but they try to discourage him Nevertheless, he holds tight onto his idea, and nurtures it. A lovely book to inspire kids not to let their ideas fall away, but to keep on working. Also available What Do You Do with a Problem?. The Book of Mistakes by Corinna Luyken. This book focuses on art, and how what a child might think is a mistake — a blob, a dribble — can actually turn into something wonderful if you use your imaginative powers and tinker with it in just the right way. The Most Magnificent Thing by Ashley Spires. Having a can-do attitude like the protagonist is a must for any person wanting to make make her mark in the world of science and technology. With the help of her assistant dog, a “regular girl” decides she is going to invent a most MAGNIFICENT thing. She has a lot of false starts. Nothing seems to be turning out the way she wants and it’s so frustrating for her! However, she takes a walk, comes back and looks at her inventions afresh, and finally figures things out. I adore the “lesson” in the book, that success comes only after “failure” (something my kids learned about failure and how it makes you think like a scientist during our diy science camp). You know: trial and error. The book is not at all preachy and Spires’s illustrations are a delight. The Almost Impossible Thing by Basak Agaoglu. A clever rabbit wants to find a way to fly. There are lots of naysayers, but rabbit is determined. He makes blueprints, conducts experiments, and maybe things don’t turn out exactly as suspected – but the effort was still a success. Crafty Chloe by Kelly DiPucchio, illustrated by Heather Ross. Inventions don’t always have to involve science and physics. Sometimes tinkering involves a lot of glitter and a glue gun. Chloe learns about the creative engineering of crafting when she decides to make a gift for a friend. Are your kids inspired to tinker? Want 52 awesome STEAM activities? 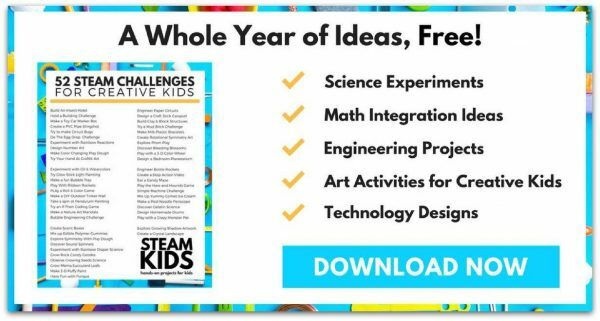 Get the free list, plus step by step instructions for 2 sample projects – all from the STEAM KIDS book I co-authored! Sign up here. This is wonderful! Thanks, Erica. Glad you like it, Johanna! Thanks for your comment. We will be checking some of these books out. My kid loves books on this topic! Great list, and a rare one, since we haven’t read a single book out of those you recommend. I’d strongly recommend 11 Experiments That Failed – another great book with a female protagonist. Fun stuff! I would add IGGY PECK, ARCHITECT by Andrea Beaty. It’s about architecture, not engineering, but has a similar feel that what I think you’re trying to get at. That’s a great one, too. I almost included it, but just decided to give it a shout out in the blurb about Rosie Revere, Engineer. They would be fun to read together. These sound PERFECT for my husband to read with the kids! Thanks for the suggestion, Kana. Those are new to me. I’d add Marvelous Mattie by Emily Arnold McCully for a girl STEM advanced picture book. Great list! I’d add What Floats in a Moat? That’s a new one to me. Thanks so much for the suggestion, Sarah! This is a great list. I’m a kindergarten teacher just about to begin a project based learning unit about force, motion, and engineering in my classroom. I will be using many of these. I especially love that you have included books with strong girl characters. One of my objectives for our unit is to help boost girls’ interest in science. Thanks for the great ideas! What a fun kindergarten project! I’m so pleased you found the list useful and I hope your class enjoys the books. For sure I would add The Most Magnificent Thing by Ashley Spires. Thanks for the suggestions! We have some of these books on other lists, but a few are new to me! I would add a book that should be right up your alley: Richard Scarey’s What Do People Do All Day! My tinker loved this book from a very young age because it shows how some people make roads, and some make houses and some grow wheat and others turn the wheat to flour and others bake the flour into bread. Andrew Henry’s Meadow, while pretty old fashioned when it comes to gender issues, is pretty great. My girls love it. I tried to get ahold of that book to read for this list, but alas, our library did not have a copy.